Historically, the British film industry has gotten little respect. Possessing neither the economic might of Hollywood, the symbolic prestige of the European art cinema, nor the exotic appeal of the new national cinemas of Latin America, Asia, and the Middle East, it has suffered from persistent neglect in the curriculum of Film Studies. The great French director Francois Truffaut remarked that “British cinema” was “a contradiction in terms”; even Britain’s own great director Stephen Frears once said that “there is no British cinema, it doesn’t exist.” In this class, we will discover that the British cinema not only exists but has proved in many respects to be a more durable and resilient alternative to Hollywood than any of the other cinemas of Europe. We will consider some of the distinctive modes and genres of British film, the special relationship between film and television in the British context, and the innovative strategies British filmmakers have used to cope with increasingly global forms of cinematic production, distribution, and reception. 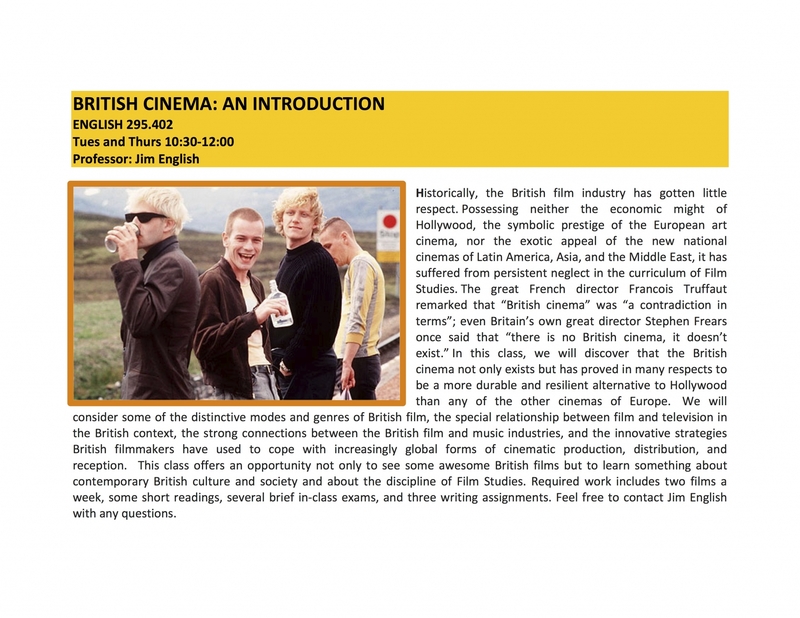 This class offers an opportunity not only to acquaint yourself with British cinema but to learn something about contemporary British culture and society and about the discipline of Film Studies. Syllabus is attached from the 2012 version of this class. This year we will be watching some different films, with more emphasis on very recent films and on the realtionship between cinema and television. But the older syllabus will give a general idea of the course structure and workload.